Oftentimes people with Type 2 diabetes need to follow a consistent carbohydrate diet to help manage their blood sugars. Carbohydrates are the type of food that impact blood sugars the most. When metabolized, carbohydrates get broken down and turn into sugar. Insulin is the hormone that takes sugar from the blood to the cells to use for energy. When you have Type 2 diabetes, cells can resist insulin and sugar remain in the blood stream instead of being taken to the cells. Modifying carbohydrate intake by keeping portions consistent can help the body to regulate blood sugars and result in weight loss (which helps your body to use insulin). One of the ways to do this is to eat the same amount of carbohydrates at around the same time daily. It doesn't mean that you have to eat the same food daily; rather aim to eat a fixed amount of carbohydrates per meal. Ask your certified diabetes educator or registered dietitian how many grams of carbohydrate you should eat per meal. One serving of cereal is considered 3/4 of a cup and, in that 3/4 cup, there is 24 g carbohydrate, 3 g fiber, and 3 g sugar. The whole box contains twelve, 3/4 cup servings. If you are going to eat more than 3/4 cup you must multiply the amount of servings you are going to eat by the total carbohydrate to determine the total amount of carbohydrates you will have eaten. For example, if you eat 1 1/2 cups of cereal (which is two 3/4 cup servings) you need to multiply the total carbohydrate by two, which means you'll be eating 48 g of carbohydrate. 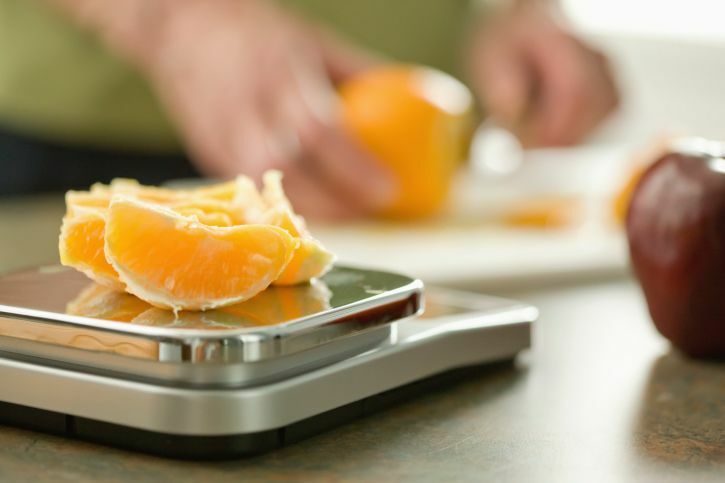 Food scales are helpful when you are trying to calculate the amount of carbohydrates in a food item that does not contain a label or for those foods where the serving size is posted in weight. For example, foods such as fruit, potatoes, and certain grains list the portion in weight. If you have a food scale, you can determine the weight of the food item and cross reference with a carbohydrate counting book or app to determine the total amount of carbohydrate in that food item.